I think one of the key moments that was really missed in the last debate is that the President has a real plan for the future of our military. Specifically, the United States Navy. See, I was in the Navy, so I catch things like this, when it involves the Navy, because I know firsthand how important the Navy is to our nation's safety and security, and also to protecting whatever it is the Navy protects. Probably other ships. But maybe like seals and whales and stuff. Global Warming is killing marine life after all. Romney went on and on about how there aren't as many ships in the fleet as in, like, the 1800s or something. Well duh, Romney, ships back then were really slow and didn't have guns. They couldn't have airplanes land on them and they only went underwater when something bad happened. Now there are these ships called "aircraft carriers" that have planes land on them, and these ships that go underwater called "nuclear submarines". Take a history class Romney. Or whatever class you take to learn that stuff. Watch a Tom Clancy movie! One of these ships could wipe out the entire 1700s American Navy! Come on! How can you compare those thousands of old ships to just one modern naval warship? That's what we call apples and oranges, Mitt. That's like comparing a modern soldier to some guy riding a horse and waving around a bayonet. One modern soldier could kill, like thousands of American troops in the 1600s. It's time that Romney gets cured of his Romnesia and learns a thing or two about the United States military of TODAY. This isn't the 1500s U.S. Military anymore Mitt. 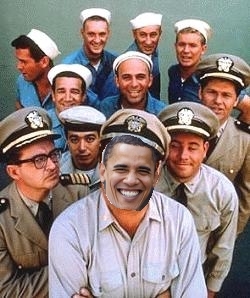 Politics aside, Obama has a real vision for the United States Navy of tomorrow, today. He plans to make the Navy greener, and better for the planet. Not only will ships be used, probably, to rescue drowning polar bears and whales and such, but the Navy will begin using one of the cleanest sources of power known to man: wind energy. That's right, Obama is proposing that the U.S. Navy starts building ships that tap into this almost unused source of free, clean, and renewable energy. Wind energy is already being used around the country to create jobs and make the environment cleaner and get Obama votes from stupid hippies make us more energy independent. The Air Force is testing fuel made from germs in planes, and so Obama is challenging the Navy to take it a step further and run their super-sophisticated ships on wind energy. To do this, the President is proposing to invest billions of dollars to fund green energy startup companies producing "wind sails", which can be used to propel ships through the water. That is progressive! That is a real plan. It isn't the kind of thing you will see out of Romney, who has no plans at all, but if he did it would probably involve building gas-guzzling ships and dangerous nuclear ships that can spontaneously explode like a Chevy Volt. So ask yourselves: are you going to vote for a guy with a plan for our future, or a guy who is stuck in the past? Hahahahahaha! How innovative! A ship that moves through the water using wind! And Obama came up with that all by himself? He and Gore should get together and rehash all of their amazing contributions to modern society.